Amanda Slamcik Lassetter has served as the Production Manager for the Department of Theatre Arts since 2015. As such, she facilitates the production process for every mainstage show, manages departmental communication, and is responsible for all scheduling within departmental rehearsal and performance spaces. She is also the department’s stage management lecturer and mentor. In that role, Amanda teaches all stage management courses and directly mentors student stage managers on mainstage and midsummer season productions as well as faculty-directed musical theatre workshops and a wide variety of graduate and undergraduate student-directed workshops throughout each year. Her professional philosophy is that the practice of stage management is an act of servant leadership within a collaborative artistic context, and she strives to model that attitude for her students. As a stage manager, Amanda has run more than 30 productions, including plays, musicals, operas, children’s theatre, and performance events. Recent stage management credits at Baylor include Crazy for You, The Amish Project, Fiddler on the Roof, Love’s Labour’s Lost, and Appropriate. In addition to teaching stage management classes within the Department of Theatre Arts, she also teaches workshops and provides guest lectures on stage management to theatre conferences and other classes. 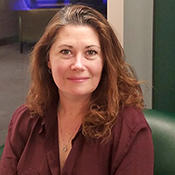 Amanda has contributed to the Texas University Interscholastic League’s One-Act Play program as a TTAO-certified contest manager at the regional level. In service to the local community, Amanda is on the Theatre Advisory Board for McLennan College and is also an Executive Co-Vice President of Production for Therapy Center Stage Productions, a non-profit designed to bring the spotlight to mental health and healing through the creative and dramatic arts. Outside of her theatre-related work, Amanda is also active as a community outreach representative for the Jack Kent Cooke Foundation, visiting local schools and colleges to raise awareness about scholarship opportunities for high-performing middle school, high school, and college students with unmet financial need. The foundation’s Undergraduate Transfer Scholar Award was instrumental in her own education, allowing her to complete her BFA in Theatre Design and Technology at Baylor University after obtaining an AA in Theatre Arts from McLennan College. Later, as a JKCF Continuing Graduate Scholar, Amanda also received her MA in Theatre Arts from Baylor. The focus of her thesis and area of secondary research is in the underlying civic narrative of performative public events, specifically as demonstrated by the Texas Cotton Palace of 1910-1930. Her work has been published in the Texas Theatre Journal. Amanda is a member of the Production Managers Forum, Stage Managers’ Association, Texas Educational Theatre Association, Texas Theatre Adjudicators and Officials, and United States Institute for Theatre Technology.